When the Ferne's away, Pinurabi will play! 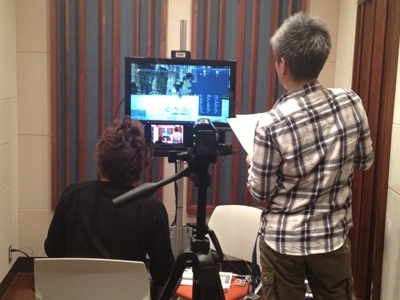 And play I did, in the sound studio as Yoshi-P and Murouchi/Foxclon/Morbol of Community & Services were recording the first Developers' Commentary video. The scene above may put fans in mind of a Letter from the Producer LIVE, though this time you get to see your two favorite presenters from the rear end. Yay! As a trade-off, though, you don't get to see the object that Yoshi-P is holding in his hands. What in seven hells is it, you ask? You'll have to figure it out from the photo below! ...So did you figure it out? I'm afraid we can't reveal any details at the moment. Please wait until the video goes live! Looks like the controller UI. That is my guess too. Interesting.. if that's what it is then it looks as though you'd be using the shoulder buttons as modifiers..
You could have up to 16 bindings this way.. and if they're really clever they could allow modifier combinations (L1+L2, L1+R1, etc) allowing for quite a lot more. It'd certainly take some getting used to, and you'd still want a keyboard around for non-vocal communication.. but this seems totally viable. Honestly I would rather have it so that they use the face buttons as combos rather than restricting the L/R buttons. Those buttons will probably be ideal for targeting. You can just as well set A+B, X+Y, etc. combos. They won't display as nicely on a UI, but if you're playing a game for a hundred hours, you can memorize your bindings without a display. Certainly not the worst way they could go about it, but they're using most of the buttons for ability selection which leaves me to wonder how they're going to implement other important battle features. This little screenshot almost makes me rather play this on my ps3 more than my pc. perhaps both! hmmm really interested now! 2011:living in vanadiel once again. Kinda reminds me of the controller setup for Tera. 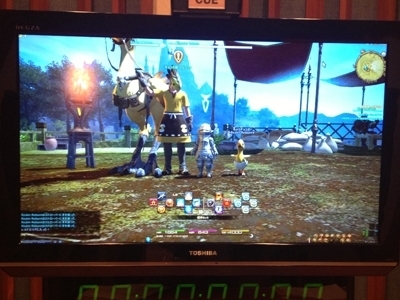 When I played Tera with a controller I thought to myself , why couldn't they just copy FFXI's controller setup? I hope they are going to have multiple options for this as I didn't care for the way Tera did it , and I'm so used to FFXI & FFXIV's controls. Face buttons as modifiers would be awkward to hit though. I mean think about it.. how easy is it to hit triangle+X? Way less easy than it is to hit L1+X. There are some inherent limits when using a controller as opposed to a keyboard.. the number of buttons you have to work with being the primary one. But beyond that you have to look at how comfortable you can make the interface when you have to control the whole thing like that. I was actually thinking about it some more after my post up there.. and there's no reason you'd have to stop at 2-button combos.. hitting combinations of shoulder buttons is quite easy. Combination modifiers would drastically increase the number of button combinations possible with just the four face buttons on a PS3 controller. I came up with 60 combinations using shoulder buttons as modifiers before I decided that was plenty and stopped. Ideally, they'd provide a system whereby you can customize your controller inputs the same way you'd customize keyboard inputs. But this doesn't seem like it'd be all that bad a way to start. Naturally you don't use combinations that would require awkward hand placements (though players have proven that they'll use them if desperate enough). You can also generally use one set of the L/R keys to designate that abilities are being used and even include the D-pad. This allows you to retain the other buttons, L1 R1 A B X Y, for top level functions (strictly speaking, you can get a significant increase just using one L or R button rather than two). Controllers are more limited than keyboards, but not in a way that actually matters... either has more than enough input options for an MMO (and are generally more ergonomic and efficient). But this is only true for the controller if you're willing to allow lots of 2 and 3 button combinations. Considering how many successful games already do require them, in much faster-paced gameplay no less, I don't see it as a problem. I think most players are capable of handling them, and should at least have the option to do so. Also. Do you know how to ask even a simple question without coming off as a snarky jerk? In other news, I like both formats of play, but I also like to keep each style relegated to it's hardware. No keyboards/mice on ps3 and no controllers on PC, unless I'm on an emulator. I, like most others I would assume, like to change it up a bit every once in a while. I've even considered setting my computer up on my coffee table, sinch my computer chair is lame and uncomfortable. As long as they make both intuitive, I'll be happy. I'm glad I wasn't the only one who went there. I actually do that and its very nice you should try it.